The Percy Jackson and the Olympians series was incredible popular when it debuted in 2005, with its first installment, The Lightning Thief. It is about the twelve-year-old titular character, the son of a struggling single-mother in New York. Percy, played endearingly by Chris McCarrell, is diagnosed with ADHD and dyslexia, has a unhygienic and cruel stepfather, and is constantly kicked out of schools due to freak accidents that seem to follow him everywhere. Percy often struggles to get second chances, which turns out to be kind of the point. He’s a demigod: half mortal from his mother, half Greek God from his absent father. And, well, all Greek heroes face tragedies. Percy is blamed for stealing the lightning bolt of Zeus and is set to find the true thief to prevent a war among the Olympians, along with his new friends and new-found identity. The five-part series was definitely one of my personal favorites, especially since I was in the bracket of “too old for Roald Dahl” and “too young to approach the later Harry Potter books”. But Percy Jackson’s appeal lied in its modernization of (pretty risque) myths as well as its more colloquial, urban fantasy approach to the young adult genre. The musical is more kid-oriented, of course, with dialogue snappy and plot heavy for an older audience (the crowd was a pretty good mix of adults and families). To be transparent, the production was relatively low-tech with a pretty small cast but that should not deter anyone with its light work, stage movement, dance sequences, and dedicated cast/crew. Not everything is a winner— some of the songs, especially “Prologue” and “The Campfire Song”, are a little hard to listen to with how precocious they come off. The gods— especially two of the Big Three featured in the second-half— were also a little hard to take seriously. Not to spoil anything, but I think they were meant to be caricatures, but I am not sure of what exactly. This characterization took away a lot of the weight behind the gods and their place in the world. Maybe that was musical’s point, but it felt disappointing all the same to get such a quick and shallow look at the beings that run these kids’ lives. But despite this, parental abandonment were still tackled head-on, keeping the demigods in the center of the story. Most children’s series are pretty inherently grim, often masked with some kind of whimsy, but the Percy Jackson franchise was its own kind of fridge horror filled with all-powerful parents who happily ditch their kids and teenagers who are tracked by monsters. Of course, this too was wrapped in a sharp and fun narrative, but the musical does embrace the underlying theme of found family, duty, heroism, and abandonment (sometimes very well and sometimes not so well— but always respecting its complexity). The contrast between the trio and the villain along with their dark backstories were especially handled very well. I could go on and on how about the subtle moments they incorporated and adaptation choices but I’m already over word count. The final song, “Bring On The Monsters”, was my favorite because of how the musical portrayed the characters and their desire to be their own people in the face of personal tragedy— it felt like a ringing summary of the series it self: rousing, bright, hopeful despite the darkness of its world. 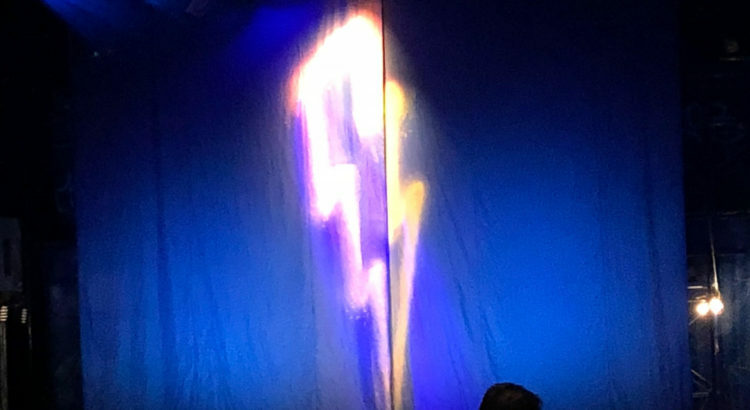 The Lightning Thief is touring until mid-summer, with the Detroit show in Fisher Theater from February 26th to March 9th. You can check out the musical official soundtrack on Youtube. is here to make friends.